This article is about the home addition to houses that can be built with the Hearthfire add-on. For general information about alchemy labs, see Alchemy Labs. The Alchemy Laboratory is one of the North Wing additions you can build to expand your home from the Main Hall. The tower can hold a large variety of storage options, as well as many alchemy-dedicated bins and containers. Plenty of ingredients are spread about when the tower is fully furnished. The Alchemy Laboratory, like its counterparts, the Library and Enchanter's Tower, has a balcony area on its roof when completed. A roof canopy can be added to these towers if desired, but not adding the final roof canopy does not prevent the tower from being inhabited, allowing it to be an optional addition. Once you have built the roof, then you can build all interior items in the tower. 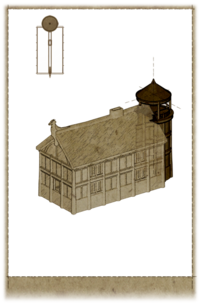 The following is a list of possible furniture items and decorations which can be added by using the carpenter's workbench in the Alchemy Laboratory . It is not necessary to purchase or build all furnishing options; you can pick and choose to better dictate style. However, all furnishing options are in a pre-arranged location and only ingredients and standard items can be moved. Oftentimes, the name of the furnishing option only indicates the primary piece of furniture, and actually includes various additional containers and accessories. A number of miscellaneous items are added with various furnishing options, but only notable items are specified on this table—specifically, usable containers and alchemy ingredients. Though other common items are added to your home, they are not listed here. The "Level" column in the table notes the level on which the furnishing option is placed: 1 for the downstairs level, 2 for the upstairs level, and R for the rooftop balcony. Note that the icon displayed for each furnishing option does not necessarily represent what is actually built in your home. Barrels Sawn Log, Nails, Iron Ingot 2 Two barrels and three sacks on north wall, west of ladder. Adds powdered mammoth tusk. One barrel and one sack on east wall. Adds one giant lichen and two jazbay grapes. Barrels Sawn Log, Nails, Iron Ingot 1 All walls. Seven barrels and four sacks total. Chest Sawn Log, Nails, Iron Fittings, 2 Hinge, Lock 2 East wall, south side. Cupboard 2 Sawn Log, 4 Nails, Iron Fittings 1 West wall. Adds two pearls, two small pearls, one set of small antlers, one powdered mammoth tusk, one nightshade, and one scaly pholiota. Display Case and Small Wardrobe Iron Fittings, 4 Nails, 2 Sawn Log, Hinge, Glass 2 Southwest corner. Display Case contains three satchels. Display Case and Small Wardrobe Iron Fittings, 4 Nails, 2 Sawn Log, Hinge, Glass 1 East wall, south side. Display Case contains three satchels. Adds one sack, three slaughterfish eggs. End Table Sawn Log, 2 Nails 1 North wall. Adds one knapsack and one taproot. End Table (2) 2 Sawn Log, 4 Nails 2 Northeast wall. Adds five spider eggs, one ectoplasm, one chaurus egg. Safe † Lock, Hinge, 3 Steel Ingot 2 Added to bottom shelf of Tall Shelf, on right. † This furnishing option only appears after "Tall Shelf" is crafted. Safe † Lock, Hinge, 3 Steel Ingot 2 Added to bottom shelf of Tall Shelf, on left. Washbasin on Stand Sawn Log, Nails, Iron Ingot 2 Northwest, in front of barrels. Adds three pearls and two small pearls. Small Shelf Sawn Log, 3 Nails 2 East wall, south side, above chest. Adds one sack, and one each of fire salts, hawk feathers, lavender, powdered mammoth tusk, and snowberries. Tall Shelf 2 Sawn Log, 4 Nails 2 Northeast wall. Adds one satchel one strong box, one briar heart and two Nordic barnacles. †Adds two safes to the Containers category. Wall Shelf Sawn Log, Nails 2 West wall, south side. Adds one knapsack and one strong box. Wall Shelves (2) Sawn Log, Nails 1 North and east walls. Adds three wheat and four glowing mushrooms. Chest Sawn Log, Nails, Iron Fittings, 2 Hinge, Lock R South side. Adds a low stand with one thistle branch. Alchemy Lab Sawn Log, 2 Nails, Glass, Quicksilver Ingot, Iron Ingot 2 West wall. Adds two sacks. Chandelier, Small Iron Ingot, 3 Goat Horns, Iron Fittings 2 Center. Hanging Rack Iron Ingot, Iron Fittings 1 North side. Hanging items: garlic braid and rabbit. Hanging Rack Iron Ingot, Iron Fittings 2 North side, west of ladder. Hanging items: rabbit and dried elves ear. Mounted Mudcrab Leather Strips, 2 Mudcrab Chitin 2 West wall, above alchemy lab. Wall Sconce Iron Fittings, Goat Horns 2 East of the ladder. Wall Sconces (2) Iron Fittings, Goat Horns 1 South side, either side of door. Wall Sconces (2) Iron Fittings, Goat Horns 2 South side, either side of door. Wall Sconces (2) Iron Fittings, Goat Horns 1 One each on northwest and northeast wall supports. Sometimes you may build an item, have it placed, and have it reappear as an item you can build again in the worktable. When selecting this item the second time, your resources are used, but no item is made. However, there is no need to select it a second time since it has not disappeared. Simply re-enter the worktable and the erroneous selection will not be offered. Sometimes it will show that the Alchemy table is built, when it hasn't. Simply remove and then replace the worktable and it should work. ? This page was last modified on 11 September 2017, at 00:47.